1. Set the power mode to ON. 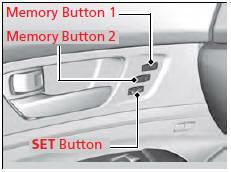 Adjust the driver’s seat, the steering wheel and the door mirrors to the desired position. 2. Press the SET button. - You will hear the beep, and the memory button indicator light will blink. 3. Press memory button 1 or 2 within five seconds of pressing the SET button. - Once the seat, the steering wheel and the outside mirror positions have been memorized, the indicator light on the button you pressed stays on. After you press the SET button, the storing operation will be canceled when: • You do not press the memory button within five seconds. • You readjust the seat, the steering wheel or the outside mirror position before the double-beep.